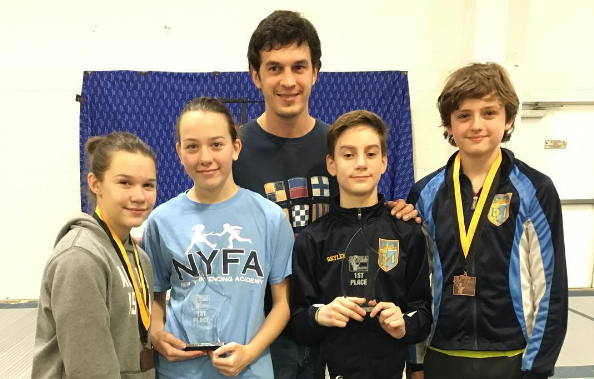 Congratulations to our 5 athletes who represented USA at the Épée Cadet European Cup in Grenoble, France — especially to Alan for winning 2 medals, and Anton for earning his first top 16 international result! Well done! Anna Lanzman – 114th out of 218 in Individuals. Anna passed two rounds of pools and won her first DE at her first cadet world. Team USA 1 is bringing home the silver! Emon Daroian, Cedric Mecke, Jonathan Piskovatskov and Alan Temiryaev went 2-0 in pools to take the top seed in the DEs. USA 1 won three matches to advance to the finals, defeating Great Britain 2, 45-25; Switzerland, 43-25; and Italy 4, 45-24. Temiryaev scored 17 in the final bout against Italy 1, but the Italians took the win, 45-36. USA 2’s team of Michael Bissinger, Anton Chmut, Eliot Herbst and Isaac Herbst adv. to the quarters, but lost to Italy 1, 45-35, and finished eighth. Individuals: In T32, Temiryaev def. Morgan Wingerter (FRA), 15-10. Chmut def. Gaetan Le Berre (FRA), 15-14. In T16, Temiryaev def. Aurelien Raulo (FRA), 15-11. Chmut def. teammate Eliot Herbst, 15-11. In the table of 8, Temiryaev def. teammate Anton Chmut, 14-13 in the rep to move into the quarters. Piskovatskov def. Temiryaev, 15-14, in the semis and went on to win gold. Alan Temiryaev took bronze. Congratulations also to our medalists at Cobra Challenge SYC & Cadets including 3 champions — Jaclyn, Skyler, and Caralina! Skyler Liverant – Gold in Y14. Skyler also got 26th out of 107 in Y12 foil! He may have fenced foil for fun, but he was just 1 touch short of making top 16, got national points, and qualified for Nationals.